Last weekend Miss 13 and I spent some time putting this mini drawer set together to match her newly painted and re-furnished room. We purchased the little Kaisercraft draws years ago at a craft fair but never got around to doing anything with it. 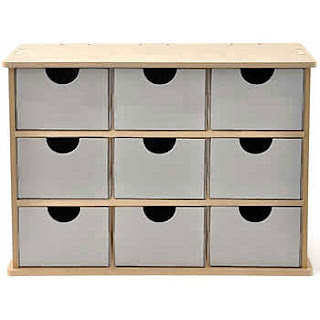 The frame is timber but the little drawers are made from a heavyweight cardboard and it all just slots together really easily. I think it's designed to use with scrapbooking paper but we used Riley Blakes 'Sugar & Spice' fabric that I'm planning on making a matching quilt out of later. We painted it in 'Tapioca' first before adding the fabric to the top, sides and drawerfronts and giving it a coat of Mod Podge to protect it.... and voila! Perfect for holding all those girly bits and pieces! WOW they look fanastic. I have a teenage daughter and I can imagine the stuff that would go in there! !